We have been studying emergent curriculum for several years with a focus on how to research the impact of emergent curricular teacher practices on child outcomes. At the Association for Constructivist Teaching Conference in NYC, October 2013, we put forth our current thinking in which we 1) present emergent curriculum as an action research approach to curricular planning and 2) ground emergent curriculum within the context of Bronfenbrenner’s theory for the purpose of measuring distinct emergent curricular teacher practices in relation to teacher and child interactions. Emergent curriculum is hard to define (Gandini & Goldhaber, 2001; Mardell & Carbonara, 2013; Jones as cited in Dittman, 1977) and we focus on the teacher practices in emergent curricular classrooms to address this problem. The Cycle of Inquiry identifies these practices (Gandini & Goldhaber, 2001), and, many of these are hidden because they represent the various phases of thinking that teachers engage in when observing, interpreting, and planning emergent curricular trajectories. Typically teacher thinking is not recorded and we believe it is essential to capture this thinking in order to measure the effects of these practices on child outcome. 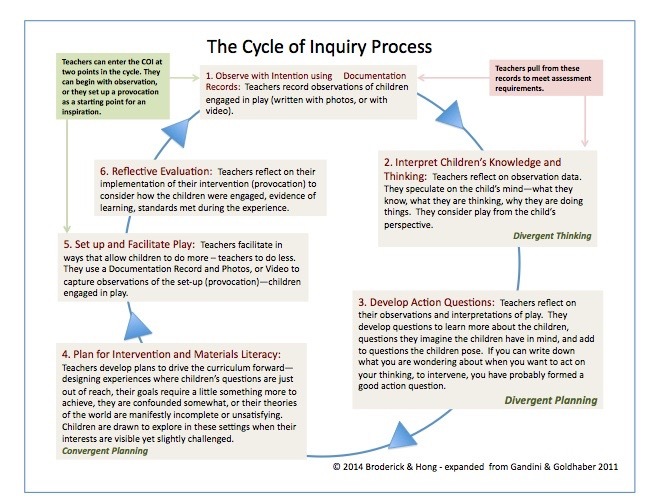 The Cycle of Inquiry System is a pedagogical tool to aid teachers in documenting the valuable thinking processes they engage in when planning emergent curricula. We continue with our efforts to study emergent curricula and seek opportunities to present, study and collaborate.